If tooth decay is extensive, it may require more than a dental filling. The existing tooth decay may threaten the health of the tooth, surrounding teeth, and surrounding gums, so we may need to cover the tooth after removing all of the tooth decay. 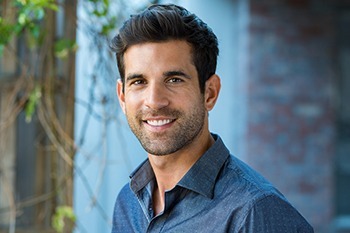 California Dental Care & Orthodontics is proud to offer a full range of general and cosmetic dentistry services for you and your entire family, including dental crowns in Rancho Cucamonga. A dental crown is a “cap” that replaces the natural crown of a tooth, and restores the size and functionality of a tooth that has suffered too much damage or decay to be adequately fixed with fillings. At your initial appointment, we take an impression for a dental crown, and make the necessary modifications to form a complete tooth. Our dental crowns are made from natural looking, translucent porcelain materials that are as strong as your other natural teeth. In addition, we always preserve as much of your existing tooth as possible, using the new dental crown to cover and seal your salvaged tooth. Trauma or Injury – A dental crown will reinforce the strength and durability of the remaining tooth structure. Root Canal – After decay or infection is removed and the tooth is filled, our dentist caps the tooth with a dental crown, restoring your ability to bite and chew normally. Dental Bridge – A crown acts as the anchor to secure any necessary bridge work to replace one or more missing teeth. Need to Schedule Your Appointment for Dental Crowns in Rancho Cucamonga? Call 909.945.0024 or click here to request an appointment today. Are You a New Patient? Don’t Forget to Take Home Your Special Bonus Gift After Your First Appointment! As one of the premier dental and orthodontic practices in Rancho Cucamonga, CA, our team at California Dental Care & Orthodontics also provides award-winning general and cosmetic dentistry to patients from Alta Loma, Ontario, Upland, Claremont, Fontana & Rialto, CA.